I am buying XOP & ECA calls across two time frames and at multiple strike prices. I believe that U.S. oil company earnings are going to crush analyst expectations the next two quarters and accelerate again late next year. 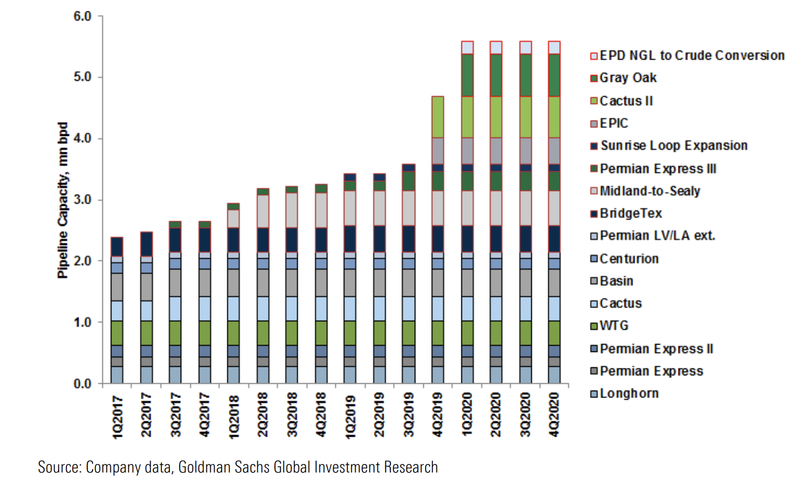 The Permian bottleneck is going to benefit from 700,000 shades of Gray earlier than expected. I have upped my oil stock allocation to 20-33% depending on the account. I will sell shorter dated calls first when the time comes, as well as, USO, DBO, USOU positions once oil sniffs $80 per barrel, keeping only a little in case of Iran conflict. This will brief as I want to get the trades out to you. I will follow up with more in depth articles in the next few days. I include bullet points here. With realized prices another 5-15% higher for oil companies, revenues and earnings are about to rise substantially again. We will start to see those hit this week. Of note, Hess (HES) and Suncor (SU) on Wednesday, Conocophillips (COP), Helmerich & Payne (HP), Marathon Petroleum (MPC), Royal Dutch Shell (RDS.A) and Total (TOT) on Thursday and Chevron (CVX), Exxon (XOM) and Phillips 66 (PSX) on Friday. There’s another big batch the following week. In the first quarter, many of exploration and production companies, as well as, integrated companies started to see free cash flow expand on realized oil prices around $50 per barrel. Spot WTI has been in the $60s with a hint of $70s for most of the year. Hedges have been coming off and companies have rehedged at higher prices. Some companies are only lightly hedging as they ride the prices up. Costs are stable in the oil patch as technology is offsetting rising prices in labor and materials. Production is about to touch 11mbd or just did depending on who you believe. 12mbd by 2020 is a virtual certainty and probably by Q3 2019. The Permian bottleneck which is just hitting now will be short lived. The Gray Oak pipeline will very likely be finished ahead of schedule by Phillips 66 and very likely expanded to 1mbd. The target date is Q1 2020, however, I expect it to be operational by Q4 2019. The Plains All American (NYSE:PAA) Cactus II pipeline will add 585,000bd capacity by Q3 2019. In the shorter term, the Permian Express 3 is adding 50,000bd by Q1 2019 and the PAA and Magellan Midstream Partners (MMP) BridgeTex expansion will add 40,000bd by Q1 or Q2 2019. Bloomberg recently noted that by 2020 there could be too much capacity. I expect the WTI to Permian oil price differential to dissipate rapidly next spring, which will add another catalyst for Permian producers. In addition, the WTI price advantage to Brent is likely to persist, stimulating exports. We will also likely see light sweet capacity at domestic refineries expanded to keep more oil at home. Remember that Saudi Arabia has bought refinery capacity in the U.S. the past couple years. That is in direct response to our oil production. They want to make sure there are refineries here that can accept and refine their oil long-term. This all adds up to a good balance coming to oil markets that will result in the “Goldilocks” price of oil being maintained a long time, ex-supply disruptions short-term and transportation problems short-term. There are several companies on that list worth buying calls on separately in my opinion, however, the group as a whole is very solid, as mentioned by Jeff Gundlach back at the Sohn Investment conference. December 21st, 2018 XOP $40 calls for around $5 or less. These will be first to sell on an autumn pop. January 2020, XOP $42 and $45 calls for between the bid price and the midpoint of bid/ask price. I own about 3x more 2020 calls than December 2018 calls and January 2019 calls (which were bought previously). The largest XOP holding is still the ETF proper. Careful not to put too much of your money into call land where time value expires. With the ETF the calendar is always on your side. It is not with calls that expire. We already own Encana (ECA) calls at $10 and $12 strike prices. The January 2019 will be sold this autumn, hopefully on a price pop. I am adding to the 2020 calls/LEAPs. January 2020, ECA $12 calls for about $3. I like Encana’s management of their operations and the simplicity of analyzing the company. In addition, the company is clearly a takeover target. I can see Royal Dutch Shell buying them out for around $20/share by spring. 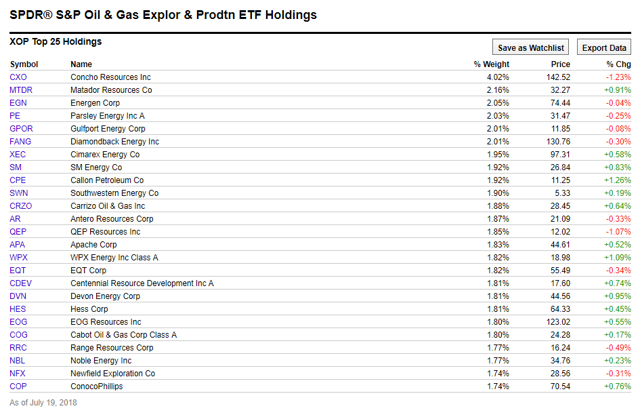 There are several Permian stocks I am looking at buying calls on. I am hoping that there is disappointment in some of their stocks in the next couple weeks. If there is, then I will be a buyer. If there isn’t, well, I own a whole bunch of XOP which they are in. Disclosure: I am/we are long XOP, ECA. Additional disclosure: I also own calls on the XOP and ECA — I own a Registered Investment Advisor – bluemoundassetmanagement.com – however, publish separately from that entity for self-directed investors. Any information, opinions, research or thoughts presented are not specific advice as I do not have full knowledge of your circumstances. All investors ought to take special care to consider risk, as all investments carry the potential for loss. Consulting an investment advisor might be in your best interest before proceeding on any trade or investment.